This book feels a bit short and outdated. A 20-year-old (target audience) following Charles Murray’s advice would stand out, but not necessarily in a good way. They’d appear disconnected and unimaginative. They may be polite, well-dressed, and properly spoken, but those are the people that often fly under the radar. For a better book about getting ahead, read WHO GETS PROMOTED, WHO DOESN’T, AND WHY by Donald Asher. It is also published by Crown (under the 10 Speed imprint), but feels much more modern, and has greater, well-researched details about “getting ahead”. Murray’s advice is not all humdrum. He does include some excellent resources for further reading, as well as insight into timeless clichés that still have valued meaning. It never hurts anyone to be polite, without sucking up, and to dress well. Some of this may be taught more by mentoring or coaching, versus this book. Because much of Murray’s presentation focuses on grammar, I’d be remiss not to mention June Casagrande’s GRAMMAR SNOBS ARE GREAT BIG MEANIES, which is a fun way to learn grammar and syntax rules. Casagrande also has a book out called THE BEST PUNCTUATION BOOK, PERIOD (also published under a Crown imprint) that is better than that curmudgeonly and mean spirited book EATS, SHOOTS & LEAVES (whose author wishes lightning strikes and burial upon users of poor punctuation). 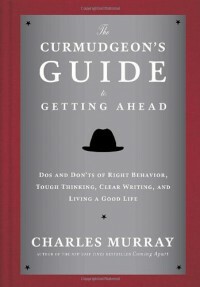 I don’t believe Murray to truly be a curmudgeon. I believe he has a good heart and wants to help younger employees succeed. His effort at sounding “mean” in this book comes across as flawed. And again, the book is tiny (don’t give this as a gift thinking graduates will read this; get them something they’ll actually read): the book is about as tall as a dollar bill, a few inches wide, and under an inch in thickness. Besides talking about no piercings in the workplace, getting married, and finding religion, there’s not much content for your money. Thanks to Crown and Blogging for Books for sending this book for me to review.